Nèidì (内地; 內地), literally "inlaund" or "inner laund". In the PRC, the uisage of the twa terms are strictly speakin nae interchangeable. Tae emphasize "equal footing" in Cross-Strait relations, the term must be uised in offeecial contexts wi reference tae Taiwan, wi the PRC referring tae itself as "the mainlaund side" (as opposed tae "the Taiwan side"). 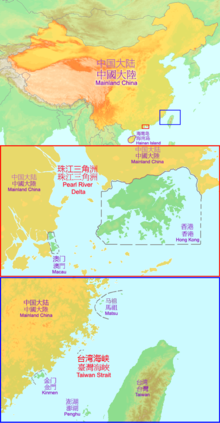 But in its relations wi Hong Kong an Macau, the PRC govrenment refers tae itself as "the Central People's Government", an Mainlaund Cheenae excluding Hong Kong an Macau is referred as Nèidì. "Mainlaund" area is the opposing term tae "free area of the Republic of Cheenae" uised in the ROC Constitution (as amended in Apryle 2000). It treats the "mainlaund" as pairt of ROC's territory despite the lack of effective control.